Two Puerto Rican singing icons of the “Nueva Trova” genre from two distinct generations are coming to Connecticut to share a Hartford stage. The October first concert, featuring directly from Puerto Rico, El Topo and Fernandito Ferrer is the headline event for Hispanic Heritage Month sponsored by Southside Institutions Neighborhood Alliance, (SINA Inc). 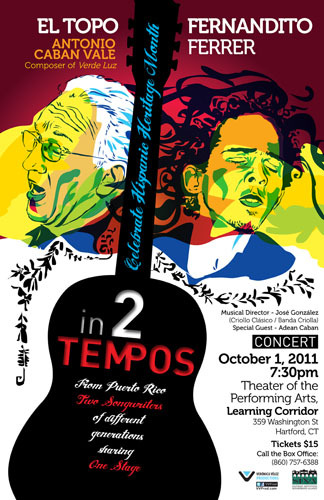 The 7:30 PM concert will be held at the Theater of the Performing Arts at the Learning Corridor, 359 Washington Street, Hartford on October 1, 2011. The “In 2 TEMPOS” concert will bring together Fernandito Ferrer who has followed El Topo’s foot- steps by composing songs about life and social issues and is the voice of the current generation. He is what El Topo started in the 70’s. The concert will bring the two distinct generations together, not only to collaborate but to recognize the continuity of this genre that will soon celebrate one half century. It will be a concert to highlight the success of El Topo as well as a “passing of the torch” to Fernandito Ferrer. Antonio Cabán Vale, better known as El Topo, is considered one of the founders and promoters of the “Nueva Trova” in Puerto Rico. El Topo has composed many legendary songs including but not limited to the patriotic song “Verde Luz”. His musical career spans close to five decades. Fernandito Ferrer, represents the voice of the people and the voice of his generation seeking to make its impact on today and tomorrow. As he labors for continuance of the “Nueva Trova” genre, the focus remains on the realities of contemporary society and the romance of the tropics. The concert’s musical director will be José González – Guitarist, composer and virtuoso Cuatro player. José González, is one of the top contemporary performers of Puerto Rican music. He was awarded the Hispanic Excellence in Music Award 2008 and was selected as one of Puerto Rico’s top 150 personalities for 2008. For more information or sponsorship opportunities call 860-493-1618 or email: lvalentin@sinainc.org.